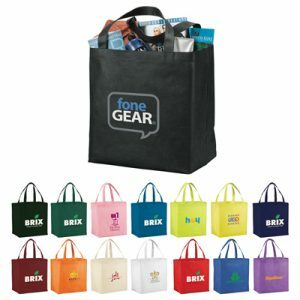 Show off your organization brand name with promotional custom tote bags! 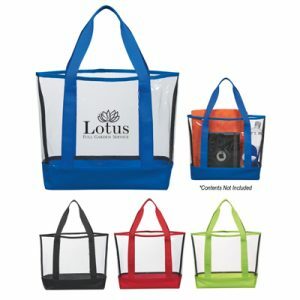 Trendy, stylish, and perfect for storing trade show goodies- you cant go wrong with a promotional tote bag giveaway. 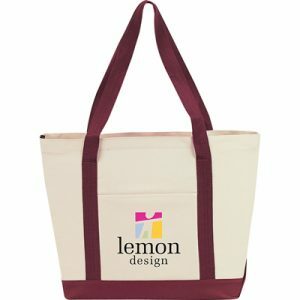 What makes custom tote bags great is that they can be used for many different occasions and events. 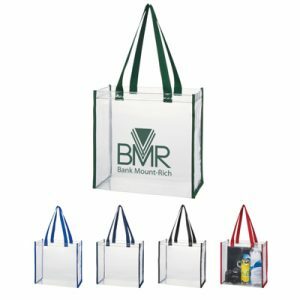 Whether its at at company outdoor picnic, a large trade show event, or just as an employee gift, custom tote bags will leave a lasting impression. 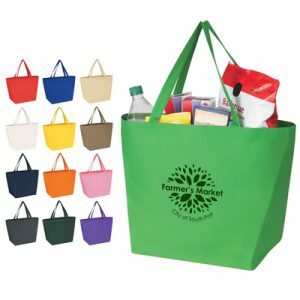 Our selection of customized totes feature durable builds and eco-friendly designs to help cut down on waste, especially when shopping. You can expect our tote bags to last a recipient for years as they showcase your logo day after day. 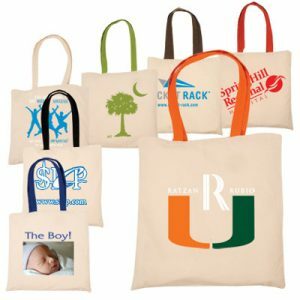 Promo Excitement offers many different tote bag shapes, sizes and design options. 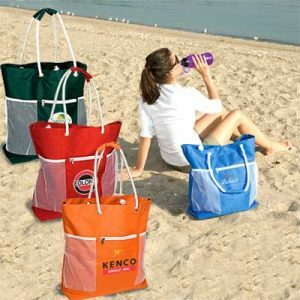 We also offer clear stadium tote bags adhering to stadium regulations and travel tote bags perfect for an on-the-go lifestyle. The first reason being that they allow for a BIG imprint area, thus maximizing the size of your logo imprint! In the world of promotional products, size certainly matters when it comes to brand recognition and impressions. 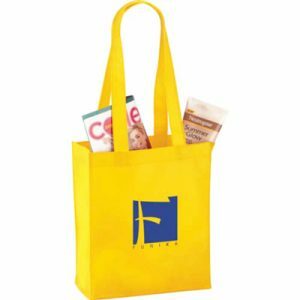 Personalized tote bags offer a large space for your brand name design, as well as any other information related to your business (such as a website address or phone number). Who does’t like receiving a new tote bag? 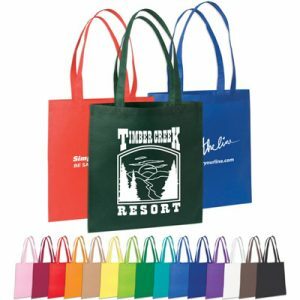 The universal appeal of custom tote bags makes them an invaluable promotional giveaway. From education professionals who take student work home to grade to moms that need to pack an extra sandwich for the big baseball game, custom tote bags are versatile in ways most promotional products can’t match. 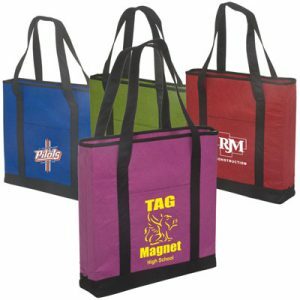 Promotional custom tote bags are not going to be immediately thrown in the trash- they have good retention rates. There is almost always a way for someone to make use of a spare tote bag, unlike other gimmicky promotional widgets. You want options between avant-garde and tacky neon? You want expensive or budget tote bag choices? You want a specific color to match your business brand image? Custom tote bags come in a huge range of customizable options, allowing you to choose a tote bag that meets your unique needs. 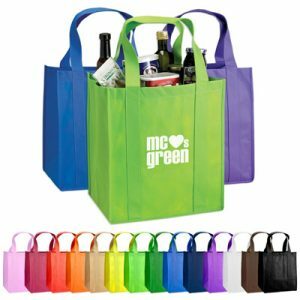 Many of the custom tote bags featured at Promo Excitement are made from recycled materials and qualify as being eco-minded! Not to mention taking one of our tote bags to go grocery shopping will cut down on plastic bag waste. Everyone wins!